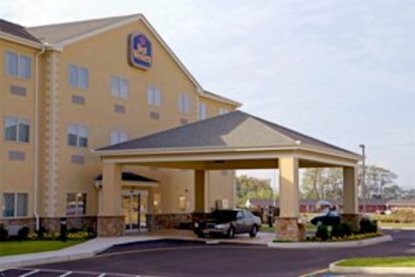 Discover this Smyrna, Delaware hotel offering guests comfortable, modern accommodations close to downtown Dover. Located in southern Smyrna, Delaware, the Best Western Smyrna Inn offers guests incredible value, modern accommodations, a warm and friendly staff and convenient location to area attractions, businesses and points of interest including downtown Dover. The Best Western Smyrna Inn is equipped with the most up to date amenities to make any stay a pleasant one. Each beautifully appointed guest room comes fully equipped with a microwave, refrigerator, cable satellite LCD television and high-speed Internet access. Guests are welcome to a complimentary continental breakfast each morning. Other amenities at the Best Western Smyrna Inn include Wi-Fi access throughout the hotel, outdoor swimming pool, exercise facility, guest laundry, a business center and meeting space that can accommodate up to 75 people. Within a 10 minute car ride, hotel guests can enjoy great entertainment offered at exciting Dover Down Slots. Nature enthusiasts will appreciate the hotel's proximity to beautiful Bombay Hook Wildlife Refuge and Delaware Agricultural Museum and Village. Families will especially enjoy spending the day at Big Oak Park which features acres of space themed play areas. The University of Delaware and Delaware State University are both located less than eight miles from the hotel, making the Best Western Smyrna Inn ideal lodging for guests visiting friends or family. Make a reservation today at the Best Western Smyrna Inn and save Management reserves the right to refuse to provide accommodation to persons of less than legal age unless accommodated by an adult. Proof of age may be required at check-in.